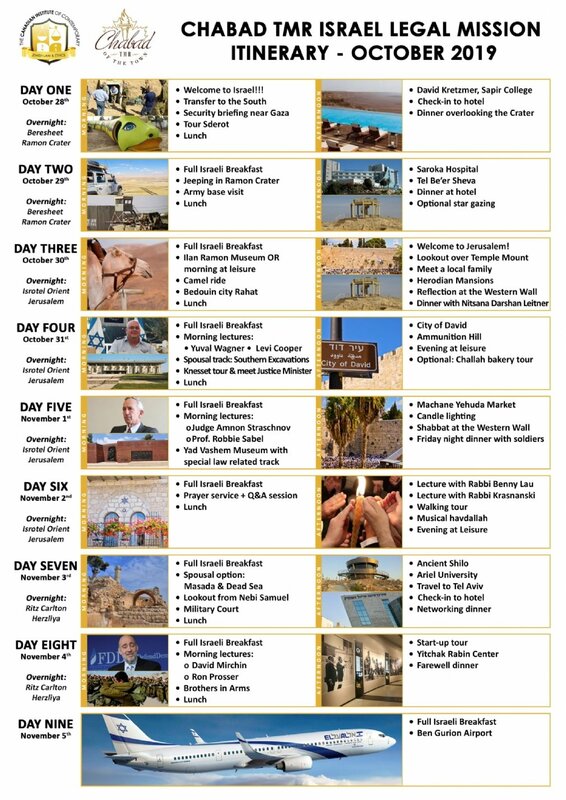 See the 2019 Trip Itinerary below for an example of what our trip will look like. Welcome to Israel!!! Arrive at Ben Gurion Airport where you will be greeted by our representatives & escorted through passport control, baggage claim & customs. Lecture with Rabbi Krasnanski; Is Israel and Jewish law intertwined and inseparable? Visit the Ariel University - lecture with Dr. Yonatan Adler, Land of Israel Studies and Archaeology, - "The Development of Halacha Through the Eyes of Archeology"
*Offering second track for spouses of touring and activities while CLE programs occur, at same cost.